Thermal expansion coefficients are determined accurately and precisely by Thermomechanical Analyzers with nanometer resolution from -150 to 1600 °C . Thermomechanical analysis (TMA) is used to measure dimensional changes of a material as a function of temperature. Thermal expansion and effects such as softening, crystallization and solid-solid transitions determine the potential applications of a material and provide important information about its composition. Viscoelastic behavior can be studied by varying the applied force (DLTMA mode). The TMA/SDTA 2+ incorporates Swiss precision mechanics and is available in four versions with furnace systems optimized for measurements between –150 and 1600 °C. The TMA/SDTA 2 + is the only instrument on the market that measures the sample temperature very close to the sample in all operating modes. This enables temperature adjustment to be carried out using reference substances (e.g. the melting points of pure metals) or through a change in length. The SDTA signal is the difference between the measured sample temperature and the reference temperature calculated using a model. This means that besides the length change, the simultaneously measured SDTA signal is also available as a measurement quantity. In many cases, this can facilitate the correct interpretation of a measurement curve. 16 000 000 data points are available for the entire measurement range of ±5 mm. This means that both small and large samples (maximum 20 mm) can be measured with 0.5 nm resolution without the need for range switching. The mechanical part of the measuring cell is accommodated in a thermostated housing. This guarantees excellent accuracy for the determination of expansion coefficients. Water from the circulator is also used to cool the furnace and reduce cooling times. The furnace chamber can be purged with a defined gas. This process is software controlled, which makes it very easy to switch from an inert atmosphere to reactive conditions. The TMA/SDTA 2+ can be used for a wide range of applications due to its broad temperature range and the wide choice of force parameters in compression and tension modes. 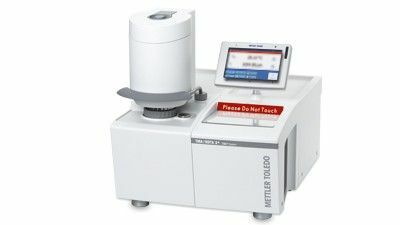 As a result, the TMA/SDTA 2+ quickly provides characteristic information on numerous types of samples, for example very thin layers, large sample cylinders, fine fibers, films, plates, soft or hard polymers, and single crystals. Thermomechanical analysis (TMA) is the ideal addition to DSC. Besides the measurement of expansion coefficients, TMA is also an excellent technique for determining glass transitions that cannot be satisfactorily measured by DSC, for example materials with a high filler content. The penetration mode is ideal for characterizing the glass transitions of difficult samples such as very thin coatings. The TMA/SDTA 2+ is the only instrument on the market that measures the sample temperature very close to the sample in all operating modes. This enables temperature adjustment to be carried out using reference substances (e.g. the melting points of pure metals) or through a change in length. The touch-sensitive color terminal for the TMA/SDTA 2+ presents clear and precise information and is easily seen from a distance. 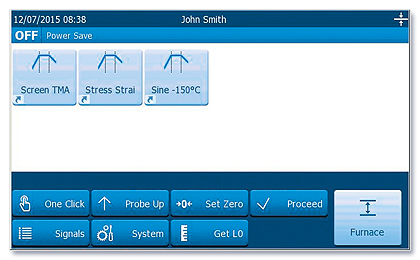 The patented One Click™ function allows you to start predefined measuring methods safely and easily from the terminal at the touch of a button.